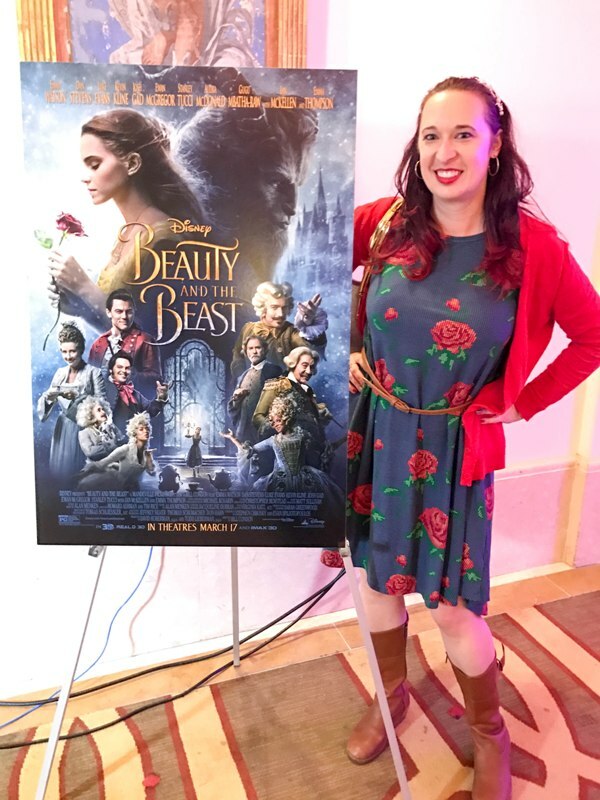 Last week I had the honor of attending a press junket for the new live-action Beauty and the Beast movie! It’s so much fun to go and witness the cast and crew talk about making these big blockbusters. 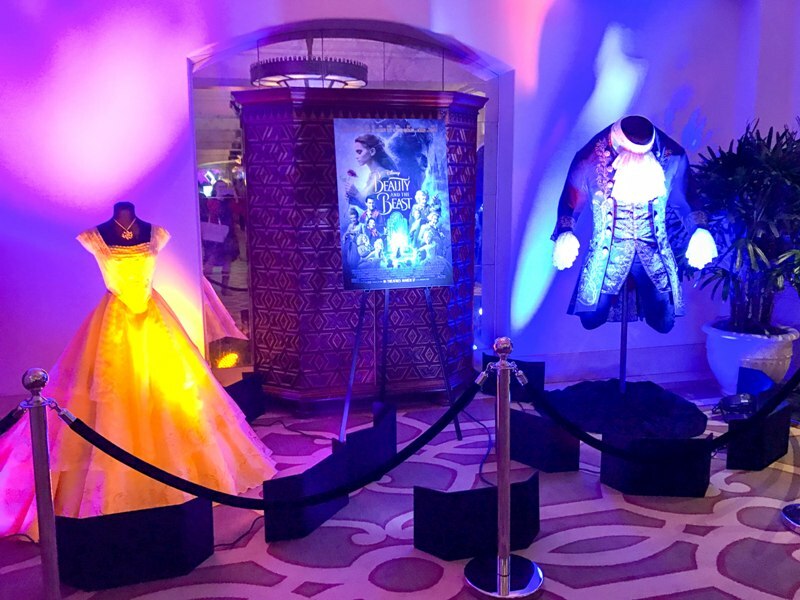 Before the interviews we had a chance to experience some of the props, costumes, and photo booths set up for the event! 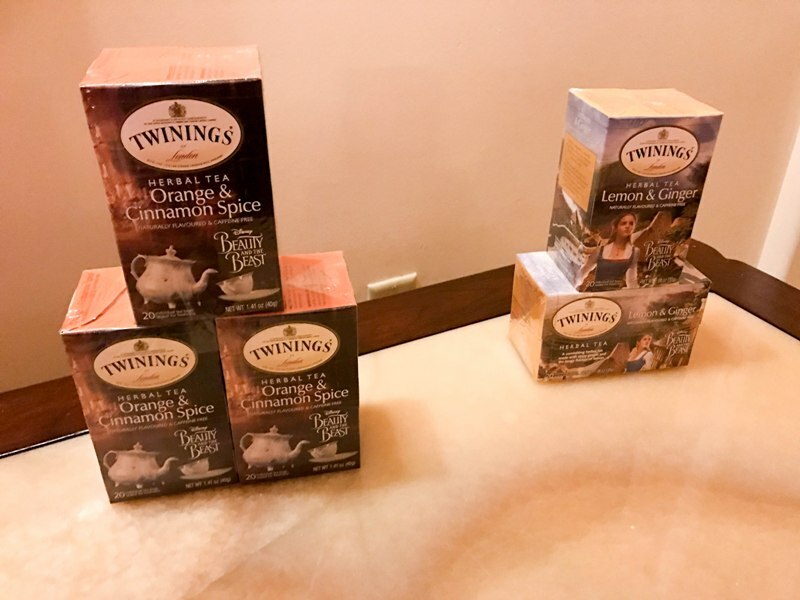 They also had an assortment of Twinnings Tea, themed for the new Beauty and the Beast movie. 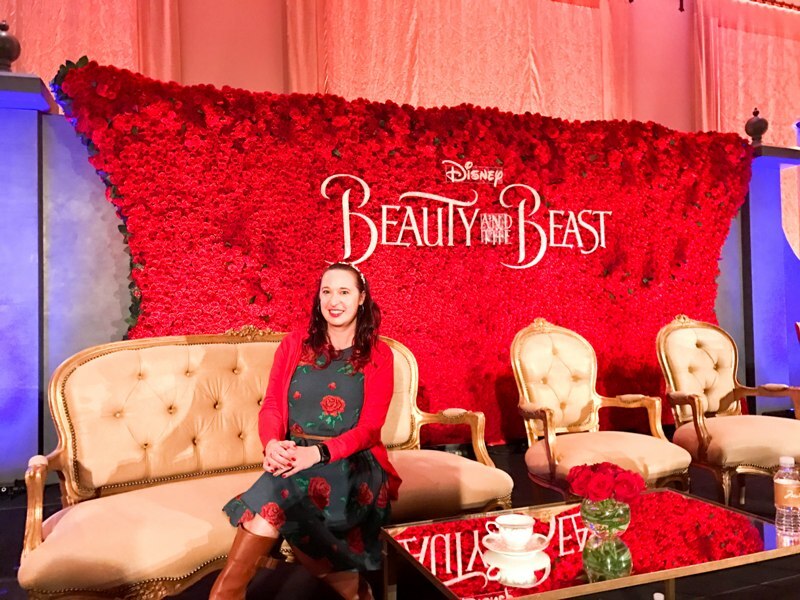 The stage for the interviews was totally gorgeous, decorated with gold furniture and red roses everywhere. 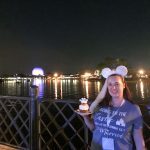 Even Mrs Potts and Chip were there! 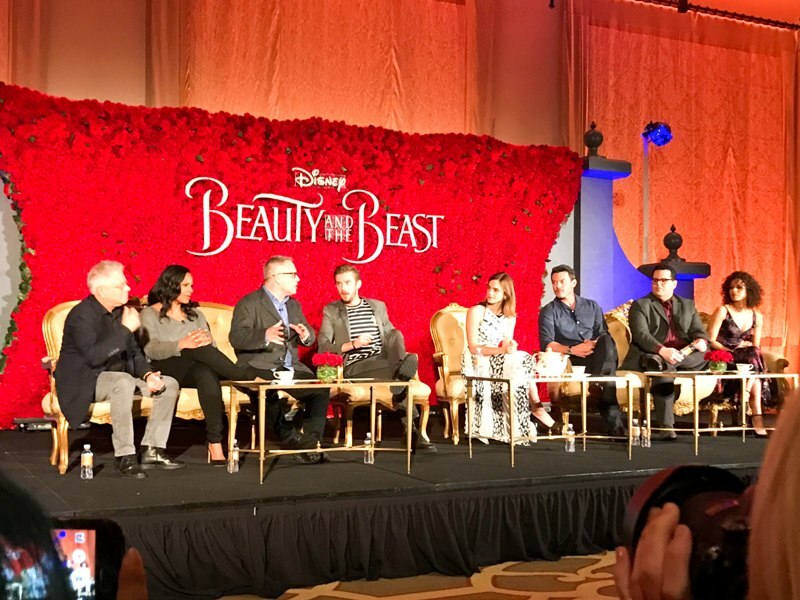 This press junket was especially exciting because we were joined by Alan Menken, the composer of several classic animated Disney movies including the original Beauty and the Beast. 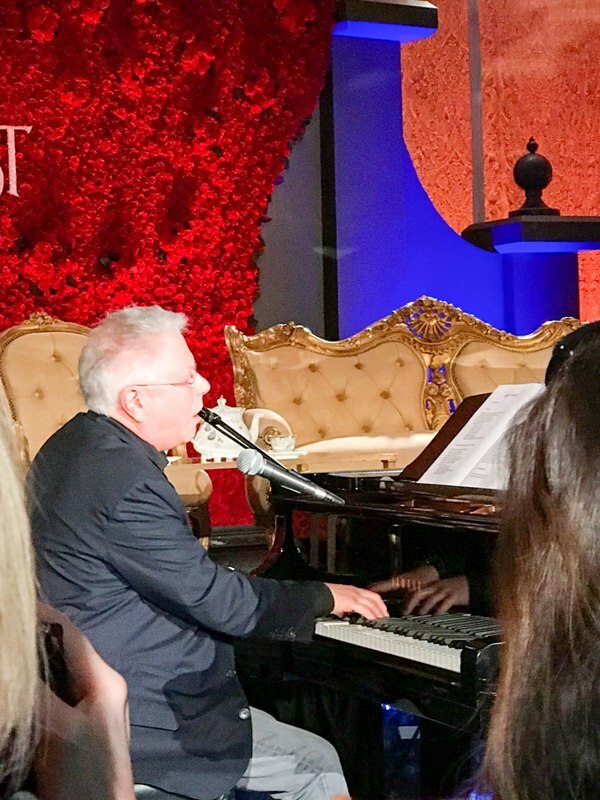 The press junket started off with Alan performing a medley of songs from the movie. 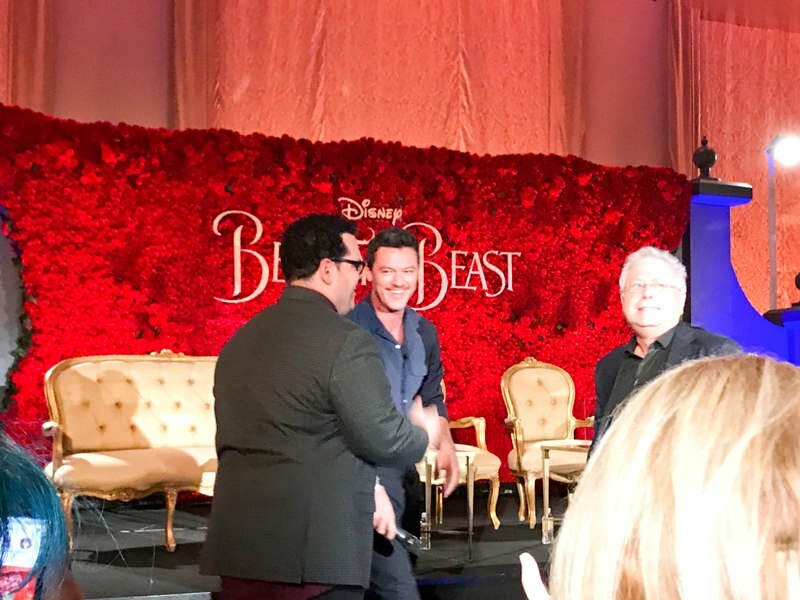 It was a total surprise when Alan was joined by Josh Gad and Luke Evans to sing “Gaston.” What a treat! I couldn’t believe I was watching this only a few feet away from me! You can see a snippet of the performance here (or on my Facebook Page if for some reason the video is not showing up). Soon the interviews started and the talent was brought out on stage. I was so star struck seeing Emma Watson in person! Joining the cast was director Bill Condon and Alan Menken. It was magical hearing the cast talk about their love of the original animated film and how they brought this new version to life. BILL CONDON: … You just start with that basic idea. You’re going to take it into a new medium which is live action. They’re going to be actors. Emma’s going to be playing a character on real locations who has to fall in love with the beast. So all the behavior which is, you know, let’s face it, an animated film is sort of, you know, a little more exaggerated, has to come into reality, and once you start to investigate that, then you realize, wow, there are questions maybe you never asked before that you want to know about. How did Belle and Maurice wind up in this village where they’re outsiders, you know, and that leads to then new songs and suddenly you’re creating something new. ALAN MENKEN: Yeah, yeah, we had these discussions. For me – sorry, you didn’t ask me the question but when Bill came aboard we had meetings about what would we add, and one of the things we talked about … getting into the backstory of how Maurice and Belle came to the town and backstory for the Beast, how he became such a cold and callous young man, and also trying to root ourselves much more in the time and place, 18th Century France, and that really helped immensely. JOSH GAD: I remember first getting the call, and I immediately flashed back to being a kid. I was 10 years old, it was 1991, and I saw the movie in a small theater in south Florida, and I remember that the response was something I had never seen before, which was audiences applauding after these animated characters were singing these songs. It was very unusual. Prior to that, like The Great Mouse Detective didn’t have much applause when I saw it [LAUGHTER]. And The Black Cauldron certainly did not. So what Ashman and Menken brought to the Disney library was hearkening back to a time of the Sherman Brothers, of you know, the early days of Disney, and that was for us, that was so a part of our childhood. Beauty and the Beast, Little Mermaid and Aladdin. I cannot tell how important that was. So I got nauseous. I was like how am I going to bring a song like Gaston to life? And I went into my office and I started singing it, and I literally started choking up, because you cut to yourself as a kid, you think back to yourself as a kid, you’re like, oh my god, I’m doing this, like I’m doing this for real, and I’m going to be the version that a lot of kids are going to see. And that was such a thrill. And my kids walked into the office and were so tickled that Daddy was singing this song that they know so well, and I thought to myself, this is going to work, this is going to work, we’re going to work at it but we’re going to make it our own. 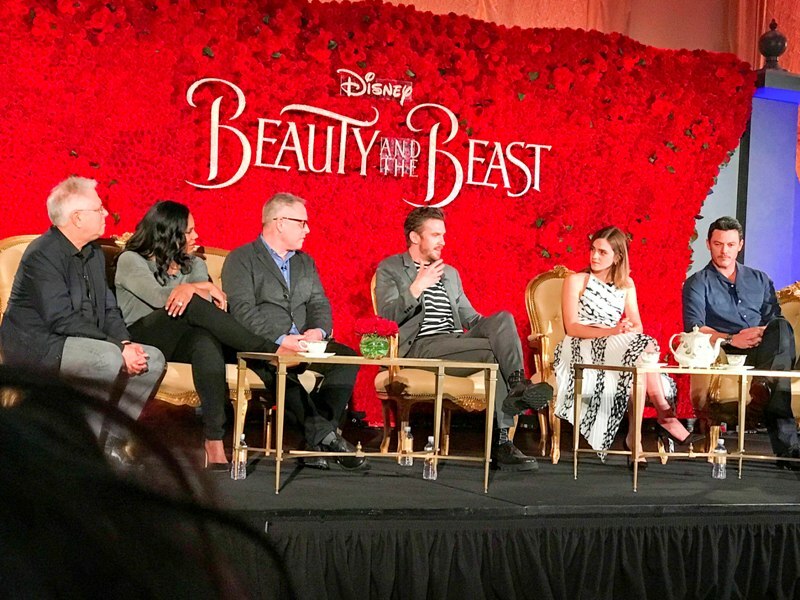 And it was that first day that we did the table read that I remember watching Luke perform the choreography for Gaston – took me a little longer to get it – and Emma [Thompson] performing Beauty and the Beast, and all of these pieces coming together before our eyes, and I don’t think there was a single one of us who didn’t have goosebumps and wasn’t immediately like – and of course Audra, you know, singing is, like, for a private concert, like that is the stuff that dreams are made of. 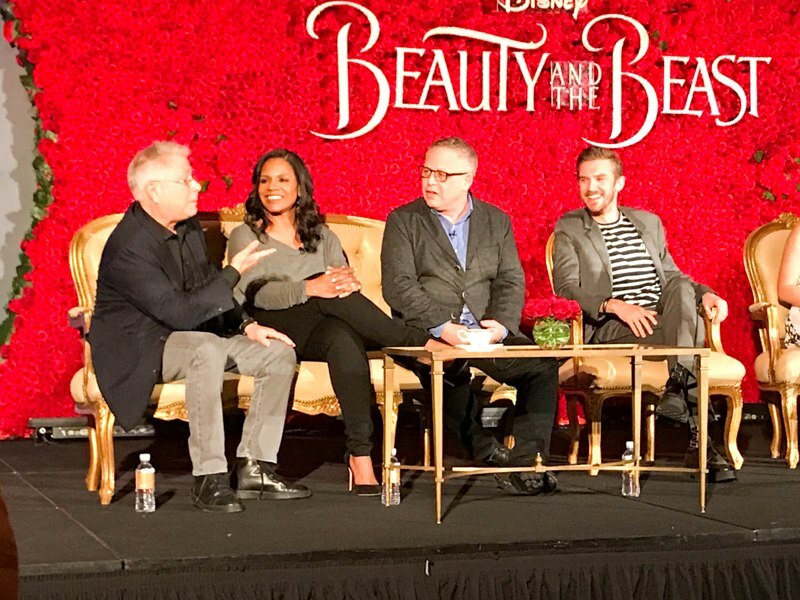 AUDRA MCDONALD: I think also the animated film was perfect, so I don’t think Disney or anybody here or anybody involved with this live action film, was like “we got to fix Beauty and the Beast.” So I think in that way the pressure was off. I think it was just “let’s reimagine it now, let’s tell this particular version.” So in that way the pressure was off. None of us were trying to – I certainly wasn’t trying to be Jo Anne Worley. You weren’t trying to be Paige O’Hara or Robby Benson or any of the characters. It was like, now it’s our turn to tell the story, this incredible story that’s been told for 300 years. But in that sense I think the pressure’s off a little bit. ALAN MENKEN: My mantra throughout the whole thing was don’t screw it up. I mean, for myself. ALAN MENKEN: When I first came to Disney, I got to say, I thought of Little Mermaid first and foremost as Howard Ashman and my follow-up to Little Shop of Horrors. 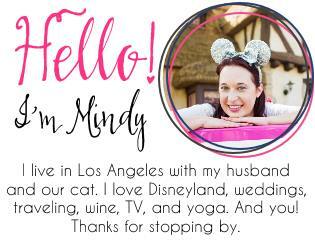 We were still working in – you know, for me, with working in musical theater, these off-off Broadway guys coming and bringing our skills to Disney. And we don’t calculate beyond telling the story and serving the characters and trying to give each of these projects its own unique musical stamp, and beyond that it’s just storytelling. You know, there’s no more collaborative form than musicals. You know, and they call it musicals and I’m the composer, but the truth is it’s a director, it’s a choreographer, it’s a lyricist, it’s a book writer, it’s a composer, it’s an arranger, it’s lighting, it’s everything put together, so I think benefited a lot also from the Disney association obviously. 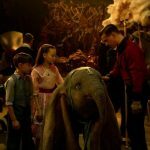 BILL CONDON: The song Evermore, the song for the Beast, you know? So they often say in musicals that people sing when it’s no longer enough to speak, that their emotions are running so high. I think it’s one of the dramatic high points in all of literature, the fact that the Beast at this moment, that he lets Belle go, becomes worthy of love, you know? And discovers what love is, but at the same time sacrifices his future. And so we talked about the fact that we needed a song, and of course there had been a song in the stage adaptation. 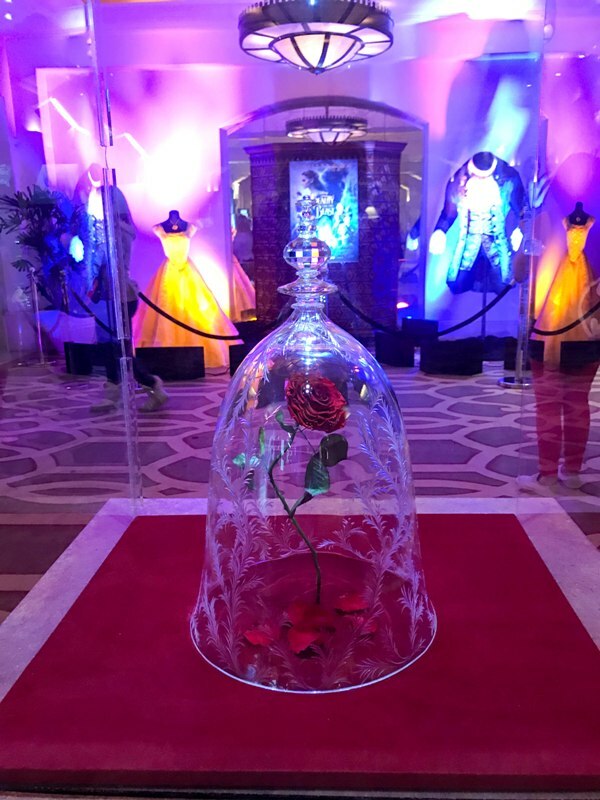 ALAN MENKEN: In the Broadway show there was a song called “If I Can’t Love Her.” But you know, each iteration of Beauty and the Beast is a different medium in a way. There’s an animated musical, there’s a stage musical, and there’s this – and they all have sort of different shapes. And the stage musical is definitely a two act structure, so we wrote this song for the Beast, because at that act break is the moment where the Beast out of anger has driven Belle away and it was important – we needed at that moment for the Beast to sort of howl for redemption or just say I’ve given up. But in the structure of a live action film, which is more of a three act structure, Bill felt, and I agree with him, that the more satisfying moment is the moment when the Beast lets Belle go because she’s no longer his prisoner, and he loves her, and the spell will not be broken now, but at least he knows what love is. 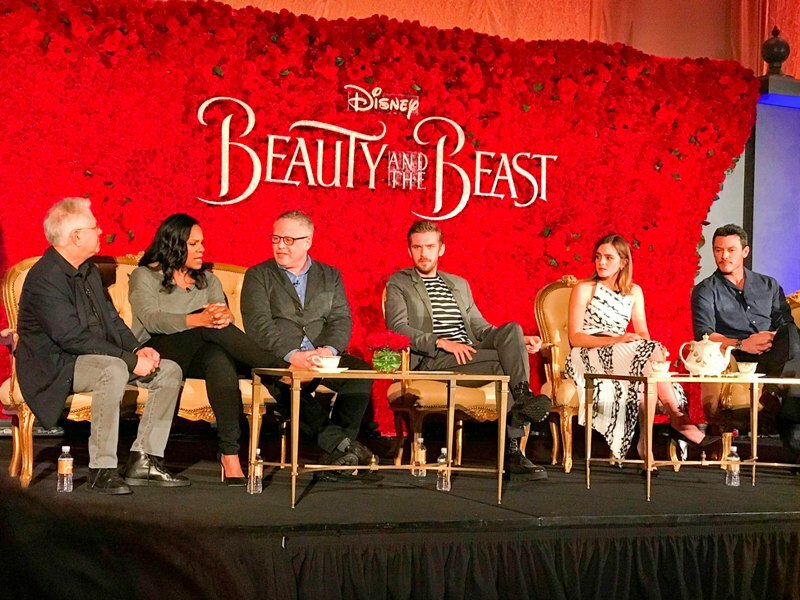 AUDRA MCDONALD: Knowing not only did [this movie] have this incredible creative team but that Emma Watson was going to be Belle, and knowing how much Emma has affected girls of my daughter’s age, and my daughter is someone who now asks for people to donate money to charities for her birthday gifts instead of presents. And that’s because of you, Emma. So knowing full well that Emma was going to make sure that Belle was somebody who was independent, who was strong, who was educated, who was sticking up for girls and women, and who does all the rescuing in the film. That’s why I knew it was going to be important for me to be a part of and for my kids to see. EMMA WATSON: It’s really remarkable to play someone that I’m almost sure had an influence on the woman that I have become. 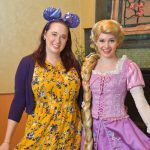 I think the first time I saw Paige O’Hara sing Belle (Reprise), you know, it’s kind of the “I want” song of all “I want” songs. And I just immediately resonated with her. I mean, I was so young I didn’t even know what I was tapping into but there was something about that spirit, there was something about that energy that I just knew she was my champion. And I think when I knew I was taking on this role, I wanted to make sure that I was championing that same spirit, those same values, that same young woman that made me a part of who I am today. And I love that in our version Belle is not only kind of awkward and doesn’t fit in, and you know, you see her reading, and you see her not really a part of the community. In our film she’s actually an activist within her own community. She’s teaching other young girls who are part of the village to read, and you know, moments like that where you could see her expanding beyond just her own little world and trying to kind of grow it, I loved that, and yeah, that was amazing to get to do. You know, I think that Belle is this ultimate kind of symbol of the fact that books can be rebellious, they can be incredibly empowering, liberating. 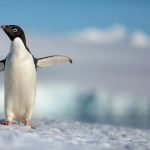 They are a means to travel to – you can travel to places in the world that you would never be able to, you know, under other circumstances. And you know, again, I was just really proud to play a character that, she has a certain earnestness about her, honestly. And she’s not in any way kind of ashamed of that, and it’s not easy being an outsider and it’s not easy to pick battles, it’s not easy to try to move and work against a system, to work against the grain, to move against the status quo. But she does so with kind of this amazing fearlessness. And you know, with the support of her father, but really I think it’s something that she weathers on her own, really, at the end of the day. And yeah, I’m very grateful that this character exists and that I get to bring her to life. It’s fantastic. DAN STEVENS: It was a very physical engagement, I think just to support that muscle suit on stilts was a challenge that I’d never really encountered before. I’ve definitely been taking a more physical approach to my roles in the last few years and just training myself in different ways. I think with the backstory we decided that the prince before he was the Beast was a dancer, that he loved to dance, and so I trained myself like a dancer and learned, you know, three quite different dances for this movie and worked very closely with Antony, just in terms of, you know, his general deportment, both for the prince and the Beast, and there was a lot of work dancing in stilts. And getting to know Emma, first and foremost, on the dance floor was probably, you know, I think it’s a great way to get to know your costar, and I’m going to try and do with every movie I do now, whether there’s a waltz in the movie or not. [LAUGHTER] But no, I mean the trust that Emma had to place in me that I wouldn’t break her toes, and also it really became part of the, that sort of crucial part of the title really, the “and the” bit, you know, and that’s sort of the essence of a waltz being two people in this whirlwind, and learning about choreography really, the storytelling through dance, not just getting up and dancing but actually, you know, really – really telling a very crucial part of the story in that big turning point. So yes, lots of physicality. 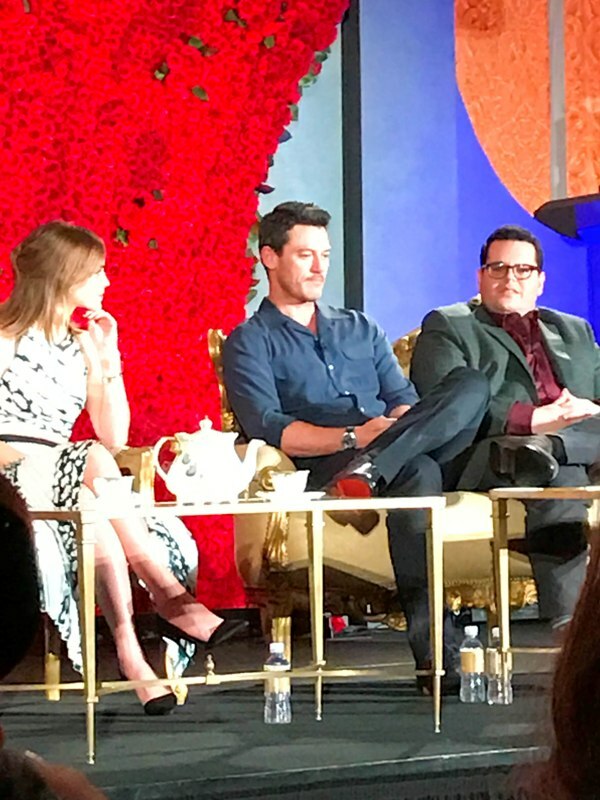 LUKE EVANS: Well, I just think a villain shouldn’t start out as the bad guy. A villain should end up being the bad guy, and I think with Gaston, outwardly, you know, to a lot of people in that village, he is the hero. He’s a bit of a stud, you know. He’s got the hair, he’s got the looks, he’s always impeccably dressed, not a bad singing voice [LAUGHTER]. He’s got a great pal who makes everybody support him and sing about him. And I wanted the audience to – in a way, I just thought, let’s make them like him a little bit first, so that when the cracks start to appear, which they do very subtly, even from the door slam, there’s something inside of him that he’s like, I’m not used to this, this isn’t how it goes, you know, this is not what she’s supposed to be doing. And although he keeps believing that Belle will change her mind, that’s where the cracks appear in my thought process and then slowly, you know, the jealousy takes over, and who he becomes, especially Gaston as opposed to other Disney villains, he has no book of spells, he has no magic powers. He’s a human being, and he uses his status within that village to rouse a crowd and he does it all from just being himself, which is quite terrifying in a way. So I played on that, I played on the humanity of the character as much as he is larger than life. There was a lot to pull on, and obviously he was a war hero of sorts, we decided, didn’t we, Bill, from the past. That’s why his murals are all over the pub that he drinks in. And there is a slight soldier, this animalistic soldier, in him when he finally fights the Beast on the rooftops. You see this man out for blood, and it’s a scary moment to see the arc of somebody who was the lovable buffoon of the village to become the beast, almost. The monster. MODERATOR: One of the most impressive things I think the film pulls off is it makes you really empathize and care about these inanimate objects. You know, I mean, they’re not inanimate, but they are objects. Doing the voice work with that, how do you inject so much emotion into something, you know, into a feather duster? GUGU MBATHA-RAW: Yeah, I mean, it was an interesting challenge, and you know, I was so obsessed with the original Disney film. You know, it came out when I was 8 years old, so I was kind of really excited to be a part of this. And for me it was, you know, working on the French accent, both myself and Ewan had the same dialect coach, and then just playing in the studio with Bill encouraging us to embrace that sort of inner child and that real sort of “let’s pretend” kind of freedom. And for me, you know, having done a few serious roles that year, to be able to embrace the feather duster Plumette and to also be able to really not be limited by you own face and your own body that you can really, as I say, just play, was so joyful. MODERATOR: Josh, we’ve seen you on Broadway, we’ve seen you in other musicals. We know you’re very adept at singing and doing comedy. In this film you get to ride a horse. How was the horseback riding for you? 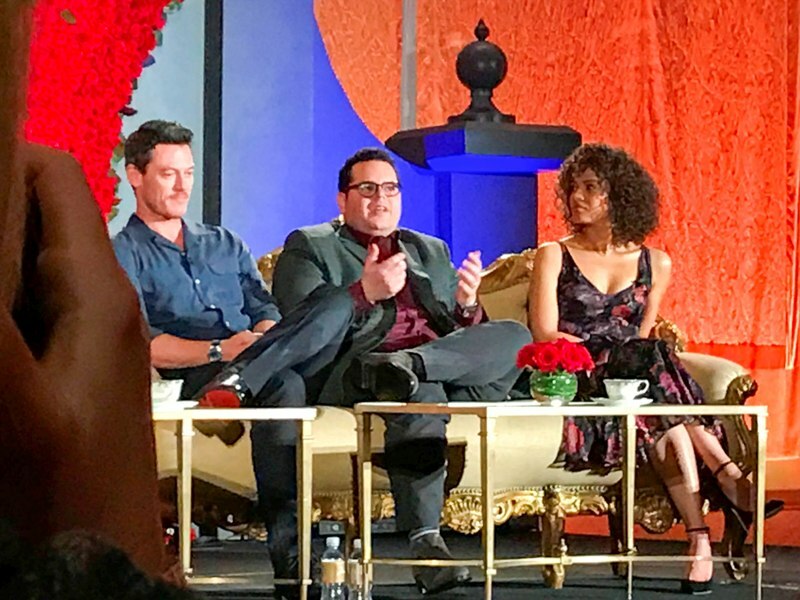 JOSH GAD: Can I get Audra’s question? [LAUGHTER] Well, I’m going to get comfortable for this. So it’s interesting. I learned a couple of great lessons on this movie, one of which is that Jews don’t belong on horses. [LAUGHTER] Specifically overweight Jews. So Luke and I are walking into the village on our horses, and on “action” all our horses need to do is walk side by side, it’s so simple. Luke’s horse does it. The two of them worked on The Hobbit together, Three Musketeers, have this incredible background. 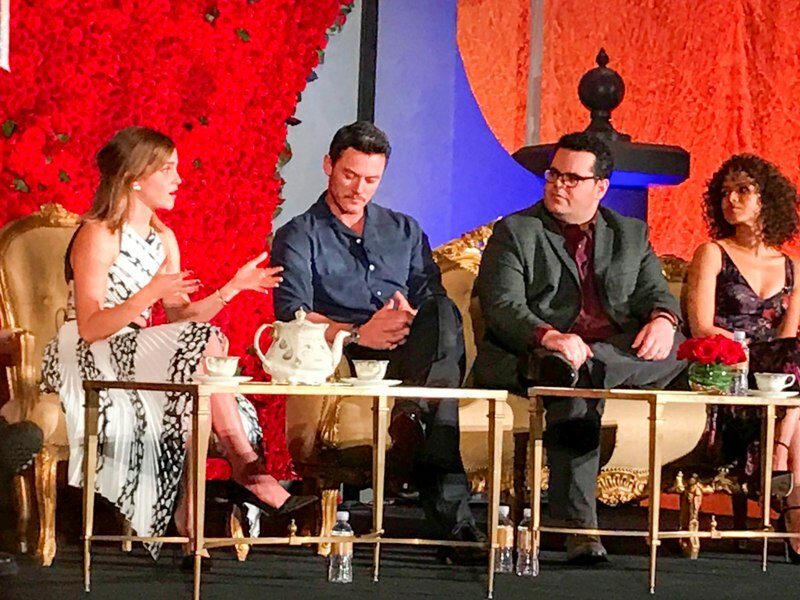 LUKE EVANS: We share a trailer. 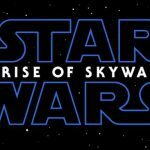 JOSH GAD: Mmmhm, they share a trailer. Mine is a cold-blooded killer. And he proceeded to moonwalk, he walked backwards. 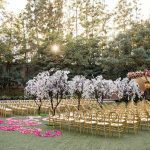 Then, he ran through multiple extras in the village, ran around – I didn’t even know it was possible – but ran through these like pillars around, up and back again. I heard “cut” and I heard laughing, and the laughter was coming from the horse’s trainer, and he came up to me and he goes, “I’m so sorry. I’ve never seen this happen before.” [LAUGHTER] And it was so sad. It made me feel so awful about myself. Ironically, my horse’s name was Buddy. That is a true story. He’s nobody’s buddy. I’m begging Disney to press charges against him, and I’ve told my agents to never send me another script with a horse in it again. LUKE EVANS: Unless it’s on wheels. JOSH GAD: Unless it’s on wheels. [LAUGHTER] In the sequel to Beauty and the Beast I drive a DeLorean. MODERATOR: There’s been a lot of talk about the sexuality of LeFou this week. How do you feel about that? AUDRA MCDONALD: I mean, I said yes the minute that Disney called because you say yes when Disney calls. If they told me that, you know, you were gonna sell churros in the park, I’d be like, yeah, I’m there. See? Audra knows what’s important. 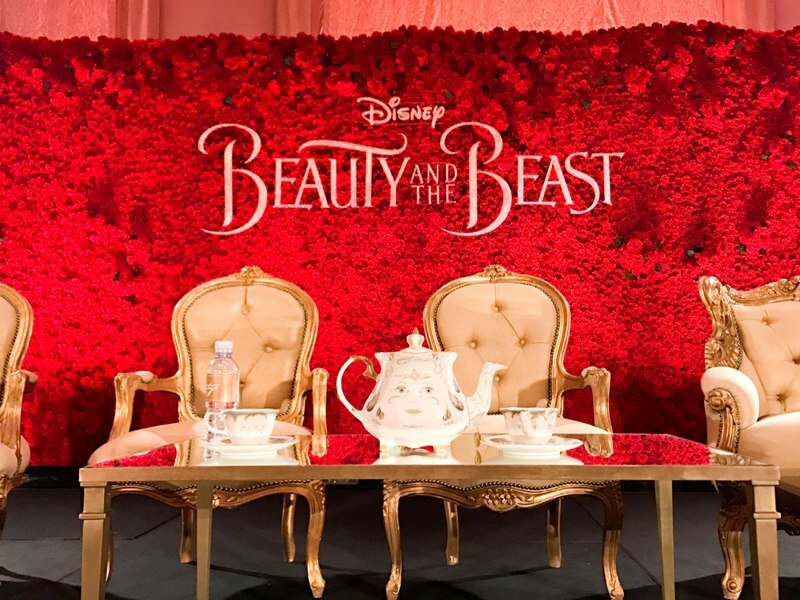 Beauty and the Beast is rated PG and is in theaters Friday March 17, 2017!